Business phone system on cloud? Yes, you can now have your businesses conversations over cloud. We provide a web and API based setup for businesses to manage customer conversations. There is no requirements for a bulky box, wires and other hardwares. Agents can now work remotely. Have a single number that your customers can reach out to you on. This number needs to be easy to remember and used in all your collaterals. Get a virtual number (Exophone ) on. Divert calls from your customer facing number to the your virtual number. Improve your caller experience by creating an IVR greeting and customizing the call flow. Calls can to routed to the right agents with Smart call routing feature. 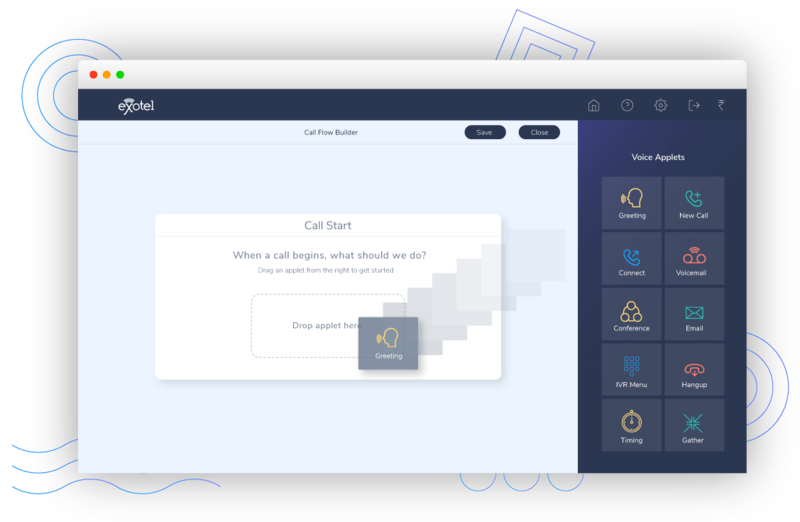 Just drag-drop applets and build your call flow. Don’t wait for developers to code them. Why a virtual business phone service? Setup a call center in minutes. No hardware installation. No maintenance. Agents can work remotely just by signing into a web portal. Build comprehensive call flows, edit your IVR greeting, customize your on-hold tone etc. all by yourself. Just plug-in your phone and you’re good to go! Save costs on infrastructure and maintenance. Get access to features more powerful than a traditional setup with a fraction of the cost. With a robust platform that provides the best analytics to make the most informed business decision. Set up a professional automated attendant script and forward calls to the right agents. Our dashboards records all your calls for you to review later. Exotel sends you daily reports for you to analyse and optimize your processes. You can reach us on email at hello@exotel.in or call us on +91-8088-919-888 18x7x365. Never miss a call due to unavailable lines. Exotel offers unlimited channels. Exotel's automated calls have helped in increasing our service levels and reducing our costs since there is no need for any manual intervention. The number masking feature has been a very worthy addition to making our customer experience even better. Very supportive and understanding staff who have lived up to every expectation, and at times exceeded them too. We have worked across cloud telephony players and with other vendors, but the fact is Exotel is dependable. Exotel's APIs are very clearly defined. Our tech team could integrate them in no time. It’s easy to incorporate into any product. We used to use a traditional PBX system before. But that doesn’t have the capabilities of Exotel’s IVR system. So, we decided to use Exotel for our IVR cancellation system. Looking for a business phone system? Try us for free! Why choose Exotel’s business telephone solution?